Maricopa County – where Greater Phoenix is located – covers 9,127 square miles – larger than several states and countries. Phoenix’s elevation is 1,117 feet offering a warm winter climate. Phoenix averages more than 300 sun-filled days per year. Phoenix has an average annual rainfall of 7.6 inches, an average annual temperature of 72 degrees with an annual average high temperature of 85 degrees. Greater Phoenix, home of InnSuites Hotels and Suites, has more than 55,000 hotel rooms and suites at 400 hotels. Greater Phoenix is home to over 200 golf courses, six lakes, and substantial diverse shopping and restaurants. More than 13.5 million people visit Phoenix each year and more than 30 million people visit Arizona each year. The typical visitor to Phoenix is 49 years old, has an average household annual income of $75,000 and spends 5 nights. Phoenix Sky Harbor International Airport is served by 20 airlines, with more than 41 million passengers a year, ranking it among the 10 busiest airports in the nation near Hotel Tempe/Phoenix Airport InnSuites boutique Collection Hotel. Phoenix is one of only a handful of U.S. cities with franchises in all four major professional sports leagues: Phoenix Suns (NBA), Arizona Diamondbacks (MLB), Arizona Cardinals (NFL) and Phoenix Coyotes (NHL). Phoenix hosted the 2001 World Series and is the home of the World Series Champion Arizona Diamondbacks. The Phoenix Suns have brought the NBA playoffs to US Airways Center 16 times in the past 18 seasons served by Phoenix Northern InnSuites. 12 Major League Baseball teams conduct spring training in the Cactus League, which in 2007 drew more than 1 million fans for the sixth consecutive year. University of Phoenix Stadium, home of 2008 Super Bowl XLII, is the only stadium in North America with both a retractable fabric roof and a roll-out grass field. The Phoenix FBR Golf Open, played each February at the TPC Scottsdale, is the best-attended event on the PGA Tour, averaging more than 500,000 spectators. The event raised a PGA Tour-record $6.8 million for charity in 2007. Greater Phoenix is home to college football’s Tostitos Fiesta Bowl and Insight Bowl. The 2007 BCS National Championship was played at University of Phoenix Stadium. Phoenix is home to many different motor sports. Included are Indy Car and NASCAR events at Phoenix International Raceway, drag racing at Manzanita Speedway and boat racing at Firebird International Raceway. Phoenix is home to the largest municipal park in the world. South Mountain Park and Preserve covers more than 16,500 acres and has more than 50 miles of hiking, biking and equestrian trails near the Hotel Tempe/Phoenix Airport InnSuites. Phoenix has museums to suit nearly every taste. The Heard Museum (Native American); Desert Botanical Garden (the world’s largest collection of desert plants); Taliesin West (home of the Frank Lloyd Wright Foundation); the Phoenix Art Museum (the Southwest’s largest art museum); the Fleischer museum (American Impressionism); the Arizona Science Center; the Hall of Flame (featuring the world’s largest collection of fire-fighting equipment); Pueblo Grand Museum and Cultural Park (Native American) and the Phoenix Museum of History are among the cultural hot spots. Arizona is home to 23 native American reservations with history, art, and casino entertainment. Arizona is home to the world renowned Grand Canyon near Hotel Aspen Flagstaff InnSuites Boutique Collection Hotel. Arizona offers diversity from Tucson to Yuma, Scottsdale to Sedona or Flagstaff to Phoenix. Visit the entire amazing diverse state of Arizona and enjoy vibrant metropolitan Phoenix, the state capitol. Tempe/Phoenix offers an abundance of family-oriented activities that encourage discovery and make learning fun. GameWorks is the incredible high-tech entertainment, restaurant and bar experience where guests can eat, drink, party and play. Each GameWorks venue provides all the best elements of a great night out in one location, including a full-service restaurant with a high-energy bar and the most entertaining and interactive games and attractions in the world. It’s state-of-the-art fun! 20-acres include go-karts, batting cages, miniature golf, bumper boats, and a state-of-the-art video arcade. Rookie Go-Karts and the Dragon Kiddie Ride are designed especially for younger children. Families will find many other ways to have fun including an award-winning, lighted, misted driving range with a two-story tee structure, natural grass tees, PGA instruction, and a complete pro shop. The Tempe/Phoenix Valley of the Sun area, with its sprawling suburbs, is home to thousands of Arizona families. They come here to take advantage of the warm weather, great schools, and professional opportunities, and as more and more families move into the area, Phoenix makes ceaseless efforts to provide a smorgasbord of fun and exciting activities designed to keep everyone in the family enthralled. Hiking, picnicking, and camping are obvious winners when it comes to family fun in Arizona, but Phoenix offers even more to its families. Unique entertainment opportunities like world class zoos and animal parks, amusement parks, theme parks, and golf and water parks. There is enough fun here to keep both parents and kids happily entertained. Zoos and Wild Life Parks. There are a number of different wild animal parks and zoos here in the Phoenix area. Located on 125 acres, inside the 1,000-acre Papago Park, The Phoenix Zoological Park is home to over 1,400 wild animals. The Phoenix Zoo is one of the largest privately owned non-profit zoos in the country and it is open to visitors 364 days a year (the park is closed on Christmas Day) rain or shine. What makes the Phoenix Zoo so extraordinary is its design. Animals are not caged here, but rather they are free to roam in expansive sanctuaries, allowing visitor to view them in their near-natural environments. The zoo is criss-crossed by four distinctively different trails leading guests to different exhibits representing a variety of species from various parts of the world. Special exhibits like Monkey Village, Wallaby Walkabout, and Danger and Deception are designed to educate and excite park guests. From Thanksgiving to early January the zoo wraps itself in 2 million lights and dozens of animated light displays creating one of the nation’s largest light expositions. “Zoo Lights” is an extraordinary event that has become a holiday tradition for many Phoenix residents. If your visit to the Phoenix Zoo leaves you hungry for more, Phoenix also has two other wildlife parks that specialize in traditionally more exotic animals including lions, tigers and wolves. The Wildlife World Zoo is an excellent choice if you’re hoping to get up close and personal with the wildlife. Located in Papago Park near the Phoenix Zoo are the Desert Botanical Gardens. This 50-acre treasure contains 139 endangered and threatened plant species from around the world. The Desert Botanical Gardens is one of only 44 gardens accredited by the American Association of Museums and is host to one of the most internationally recognized and impressive displays of desert plant life in the world. The Gardens see a quarter of a million visitors pass through their gates each year. You may think that wandering around, looking at plants, sounds a bit dull, but rest assured, the intense beauty of the gardens can turn anyone into a horticulture enthusiast. For a true taste of the southwest, Rawhide Wild West Town aims to please. This rough and tough authentic western town escorts its visitors back in time to the days of the old west complete with gunfights, stunt shows, gold panning, stagecoach rides, shooting galleries, and even a petting zoo for the little kiddies. Visitors will be impressed by the authenticity of the surroundings and the costumes. Rawhide also offers a full service steakhouse where patrons enjoy real western cooking, and you can make your meal even more exciting by participating in a true sundown cookout. Rawhide has been a Phoenix attraction for over 35 years and sees more than 600,000 visitors each year. Rawhide is located just south of Phoenix on the Gila Indian Reservation near the Wild Horse Pass Casino. Kids Theme & Amusement Parks. Kids still need to burn off some energy? Phoenix is home to several water parks including Big Surf, Golfland Sunsplash, and the newest water park, Waterworld Safari. All three parks offer a variety of water rides including water slides, inner tube rides, wave pools and river rides. The parks are open seasonally, usually opening each year in late April or May and closing in November or December depending on the weather. If you prefer to keep everyone dry, check out Castles ‘N Coasters in Phoenix or Cracker Jax in Scottsdale. These amusement parks offer miniature golf, go-cart riding, and assorted rides and games for everyone in the family to enjoy. If your still not satisfied, milk a cow and take a tour of a leisurely and historic train ride at McCormick-Stillman Railroad Park. Phoenix’s museums offer an array of activities for children and families to discover. And much more making Hotel Tempe/Phoenix Airport InnSuites Hotel & Suites, Your Suite Choice Value! 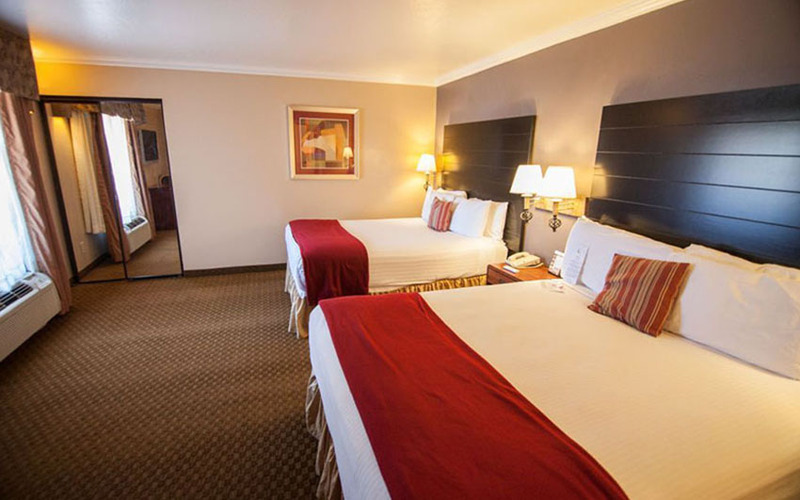 For Tempe AZ Hotel Packages and Deals, look to Hotel Tempe/Phoenix Airport InnSuites. 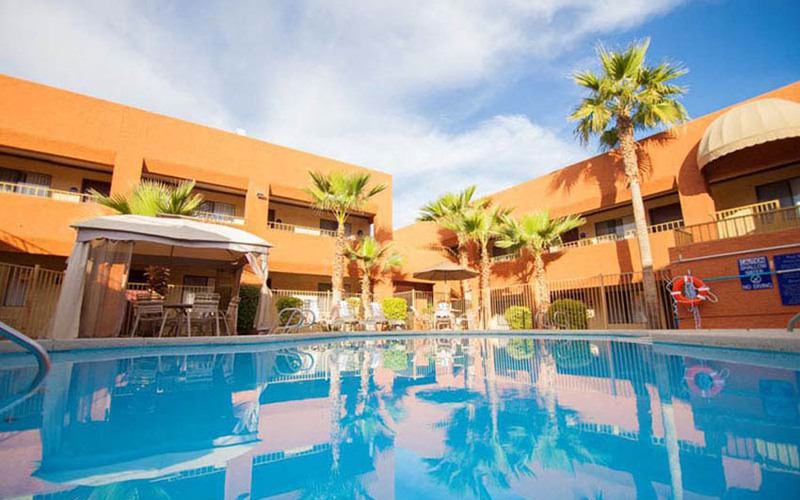 No matter where or when you travel, Hotel Tempe/Phoenix Airport InnSuites Hotel & Suites can make your trip a great experience and value by giving you the travel deals and hotel deals you deserve. Want last minute deals and other travel specials sent to you? 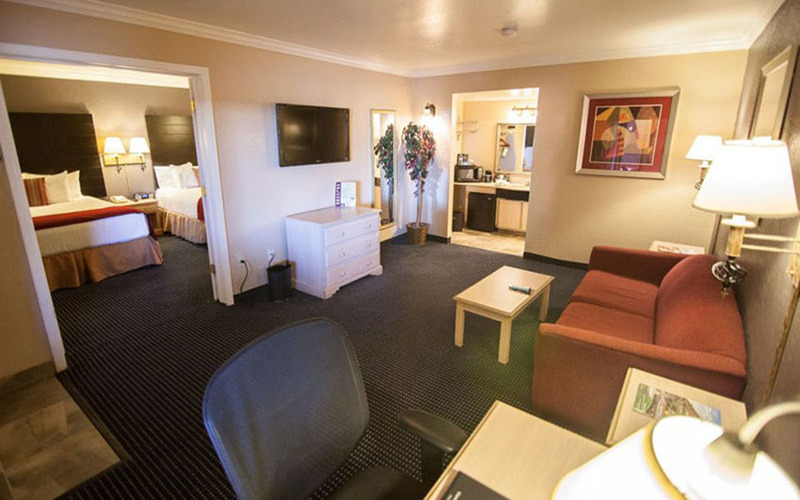 Hotel Tempe/Phoenix Airport InnSuites Hotel & Suites caters to a variety of leisure, corporate, government, group and extended stay guests. To meet your independent traveling needs, call the Sales Department at 480.897.7900. We look forward to serving you. 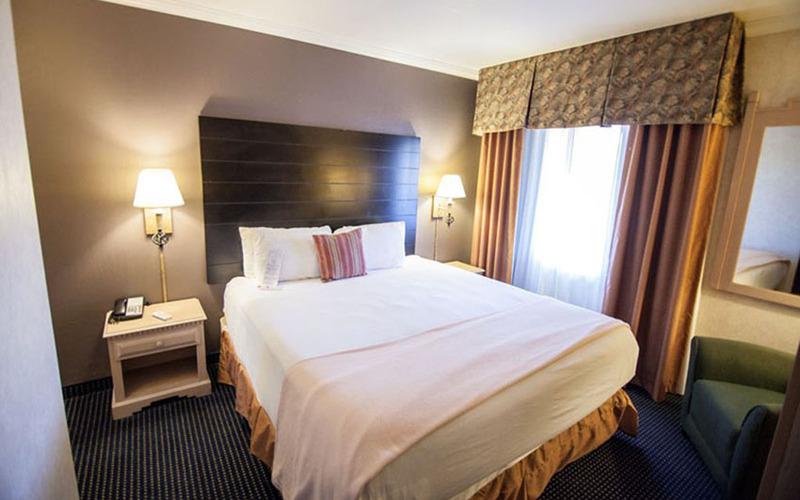 For business executives who wish to ship their conference, meeting or other information to our Tempe hotel, please address to Guest Name, c/o Hotel Tempe/Phoenix Airport InnSuites Hotel & Suites, 1651 West Baseline Road, Tempe, Arizona 85283. 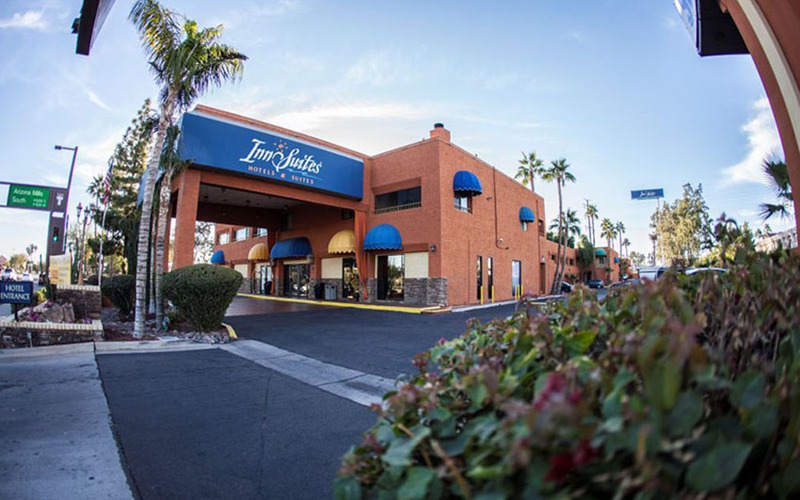 Hotel Tempe/Phoenix Airport InnSuites Hotel & Suites, member of OOIDA, offers special Commercial Drivers License (CDL) rates and discounts. When making your reservation or upon arrival, please ask for the CDL rate and show your CDL. Hotel Tempe/Phoenix Airport InnSuites Hotel & Suites in Tempe, Arizona works with CLC Lodging to bring substantial benefits to its workforce travelers coming to Arizona. If you are unsure if your company works with CLC Lodging, contact your company representative.